Edward has decided to leave his backpack behind because of his injuries sustained on the job years ago. He’s just carrying a small bag of essentials. Easy day of 21 km (13 mi). Lucky to find quarters at the rectory, but only one bed–so we’ll see. Just waiting for a wedding to end, then the priest will have time for us. On the way we spotted examples of muddy patches that we missed for not taking the muddy route–we stick to the highway. Also saw a stork (good luck symbol) and an old Trabi (East German car during Communist times. The pic of the buildings was here in Tarnow dating from Soviet times. The painting in Pilzno’s St John’s Church is the famous “Our Lady of Consolation” from earlier than 1241, destroyed, then recreated in ca. 1500. Amazing, i am on my own pilgrimage of getting my silly pumper fixed. Not walking at your speed, but soon!! What an experience with these lovely people and really taking in the beautiful countryside. Any blutwurst experience? Sending greetings and Love from Springfield OR. Die Ilse gruesst ganz herzlich. 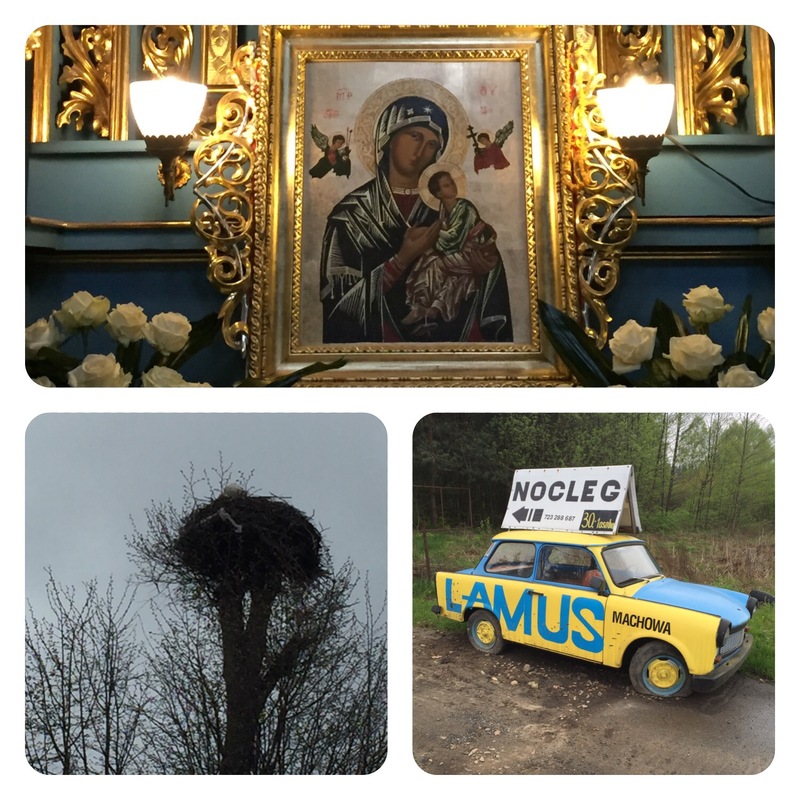 I love the the icon painting of Our Lady of Consolation and seeing the stork nest. Hope seeing the stork brings good luck to your journey.